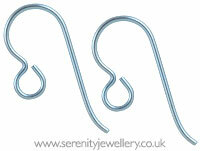 Hypoallergenic anodised niobium earring hooks (ear wires) to replace the hooks on existing earrings or to make your own. Open with pliers, ideally covered with masking or electrical tape to avoid damaging the colour as anodising changes only the surface colour of the niobium. Please note: Polished niobium is darker than silver. The hooks do not come with stoppers but you can use the Blomdahl hook stoppers with them. Niobium is the best hypoallergenic metal there is, my skins reacts to all other metals, but not niobium. Gorgeous colours for the perfect match to beads to make the loveliest earrings! I’m delighted with these! My metal sensitivities have meant not being able to wear some really pretty earrings without ending up with sore, red, weepy lobes. I replaced the hooks with these and my skin had no reaction whatsoever after wearing all day. Good colour, good value, good experience! I get all my earring hooks from Serenity Jewellery. 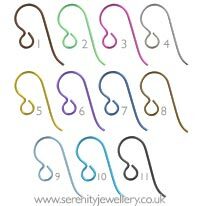 Great quality, nice wire gauge and the color combos are gorgeous. Ordered from this shop many times. Thanks! Like the various colours in these. Got the yellow to put yellow gold plated eardrops on as I cannot wear the fashion earhooks. I have no problem fitting these to the drops and no problem on wearing. So much so I have just ordered several more of them in this and other colours. Beautiful and simple, easy to fit, thank you. So far, so good. Haven't worn them for protracted periods so can't really comment on the allergy front but nice to have the colour choice. 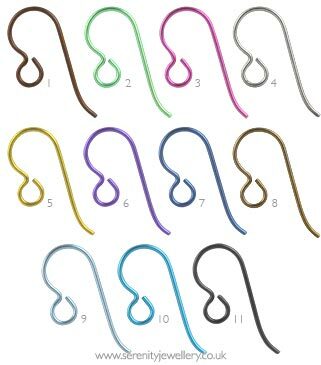 I have a bunch of earrings from various craft projects and using these hooks I can get cute styles with no risk of itching and discoloration.